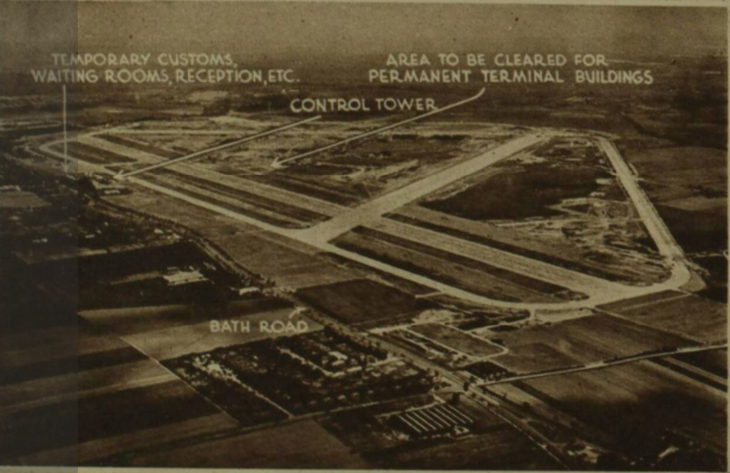 The image above shows the future of Heathrow Airport, as envisaged in the Illustrated London News of 25 May 1946. Today, we debate whether the airport should get a third runway. Had this scheme gone ahead, it would have boasted nine. 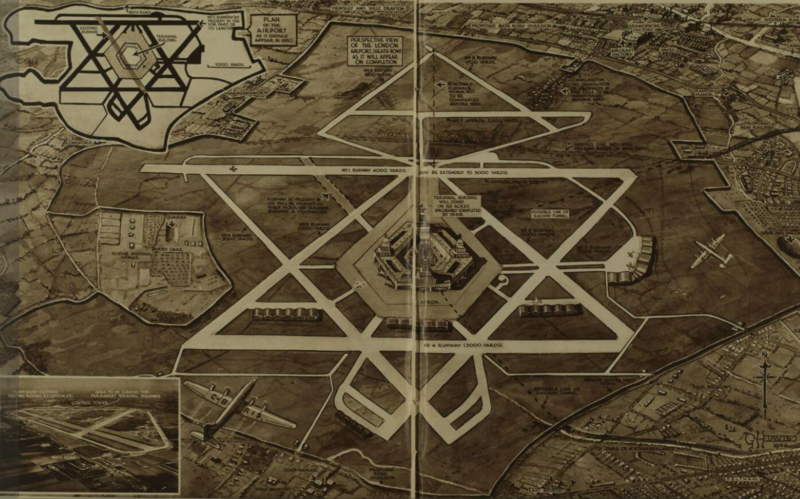 In 1946, the facility had only just opened for civilian flights. It was then known as London Airport because 'apart from other considerations, many foreigners have experienced difficulties pronouncing the former name [Heathrow]'. The 1940s airport was much smaller (see below), and served by temporary buildings. During this era, the airport maintained six runways: the two east-west strips that remain today, plus pairs running SE-to-NW and SW-to-NE. The two larger runways were capable of handling 'the heaviest aircraft at present envisaged, including the 110 ton Bristol Brabazon 1'. Nowadays, Heathrow's runways accommodate the Airbus 380, which can weigh almost 600 tons. A further phase of expansion would have seen the airport stretch northwards. This would have required the complete demolition of Harlington and Sipson, plus the diversion of the Bath Road. 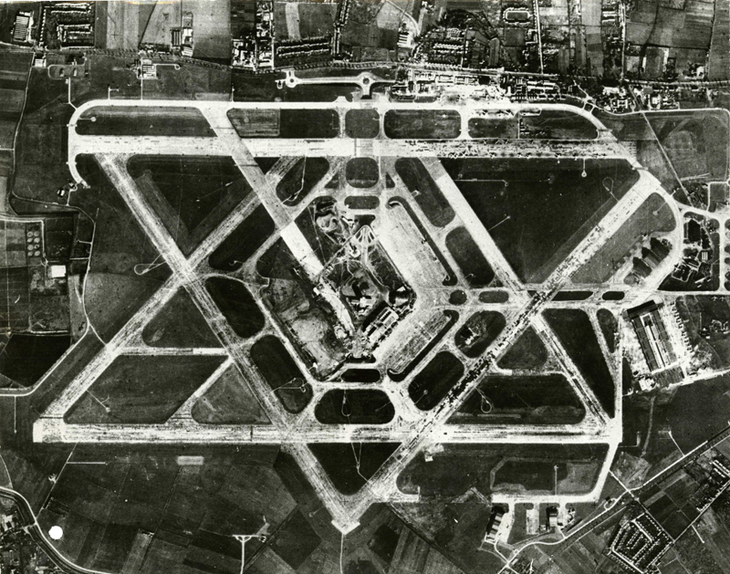 In their place, three additional runways would have been built in a triangular formation, bringing the total to nine. As a 1946 article noted: "This work will not be undertaken before 1950 in order to... give ample warning to the householders concerned." That expansion proved too costly and controversial, and it never happened. In fact, Heathrow lost most of its runways. Since the 1970s, it has been reduced to just two east-west strips, extended versions of those shown in the plans above. The shorter runways were simply inadequate for modern aeroplanes. Their footprint remains, though. 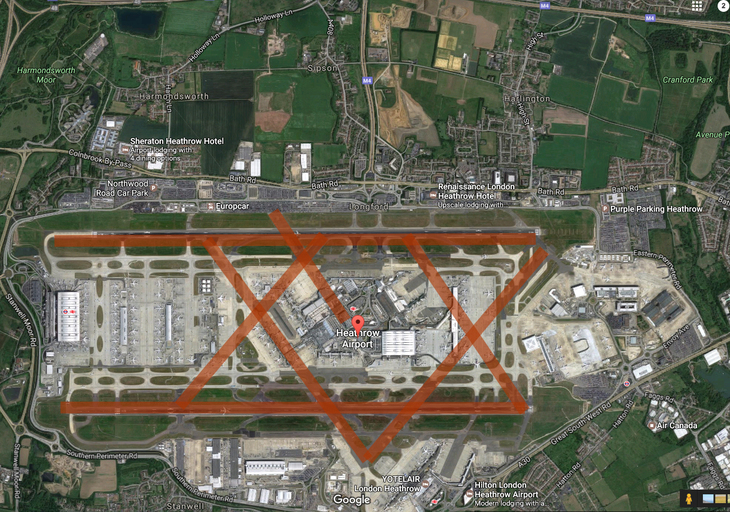 You can still see much of the star pattern in an aerial view of Heathrow, though it's now mostly covered by terminal buildings. Plans to extend Heathrow are, of course, still very much alive. 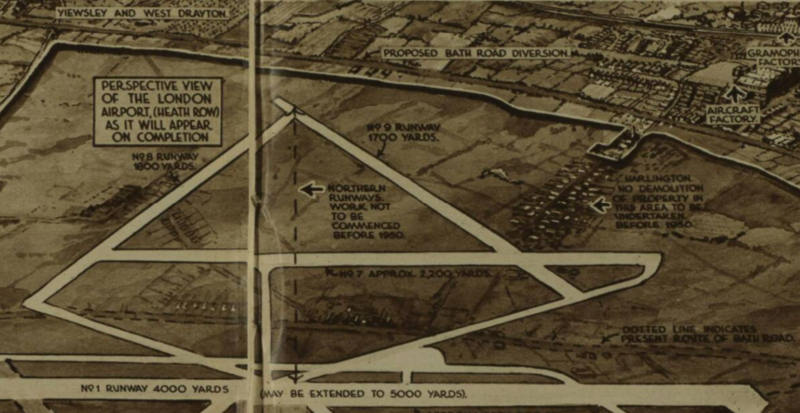 The most likely scheme would see a third runway created to the north-west, obliterating much of Harmondsworth. Such destruction is as controversial today as it was 70 years ago. Perhaps the authorities should try one of these seven radical ideas for improving airport capacity.